AUSTIN, Texas and SAN SALVADOR, El Salvador, January 27, 2011 /PRNewswire/ -- Ringdale, Inc., a global leader in the development of intelligent LED lighting technology, and Clean Technology Solutions (CTS) LLC, a major distributor of energy efficient technologies in Latin America, today announced the first sale of Ringdale'sActiveLED(R) line of commercial lighting fixtures in the region. CTS was successful in selling ActiveLED2' x 2' Recessed Ceiling Panel Lights and Recessed Ceiling Downlightsto an office building in San Salvador, El Salvador. 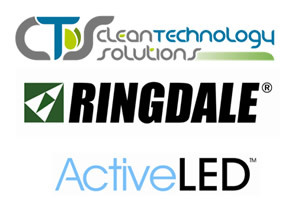 Ringdaleand Clean Technology Solutions recently signed an agreement to have CTS exclusively distribute the ActiveLEDproduct line to the rapidly emerging green building market in Latin America. "We are excited that our partnership with Ringdaleto bring ActiveLEDto Latin America quickly resulted in the completion of a sale that will significantly lower our customer's energy costs," said Adolfo Salume, CEO, Clean Technology Solutions. "ActiveLED, which offers the broadest range of commercial indoor and outdoor LED lighting products in the industry, will benefit Latin American businesses eager to implement energy efficient solutions in almost any application scenario." Ringdale'sActiveLEDline includes fixtures for streets and roadways, parking structures, billboards, building exteriors, warehouses, offices, retail spaces, parks and restaurants. The fixtures deliver better illumination and use 50-95% less energy than fluorescent, incandescent, high-pressure sodium and other conventional light sources, and last far longer. "We are pleased to have Clean Technology Solutions help us expand our global range of customers," said Klaus Bollmann, CEO, Ringdale. "We hope to leverage CTS's relationships in Latin America to accelerate sales of ActiveLEDin the region." Ringdalefocuses on helping organizations incorporate green savings into their business environments. Ringdaleprovides ActiveLED(R) luminaireswith patented, solid-state lighting control and thermal management technology as well as a wide range of secure document output management, access control and document workflow solutions. RingdaleInc. is based in the United States with offices in the United Kingdom, France, Germany, Japan and Singapore and is part of the Network Technology PLC Group of Companies.